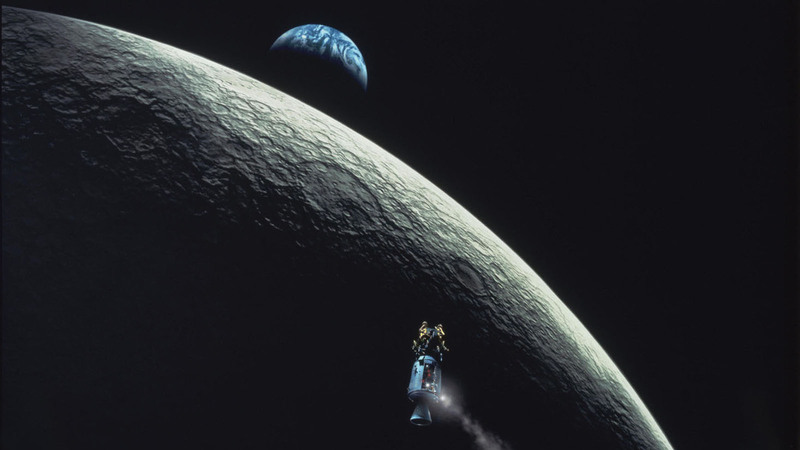 I recently purchased Apollo 13 on Blu-ray; the 20th Anniversary edition- yes, another sobering reminder of the march of time; has it really been twenty years? This edition apparently sports a new remaster which improves on the image quality of earlier HD editions, but as my previous copy of Apollo 13 was its first R1 DVD edition from many, many moons ago (sorry, couldn’t resist) then this would no doubt certainly be a richer experience than before. I hadn’t seen the film in years, just catching isolated moments on its many tv airings so I looked forward to watching it. Sadly the subsequent tragic death of James Horner last week made re-watching the film rather poignant, as his score is such a large part of the film’s success. It’s a wonderfully effective score, melodic and powerful, the kind of score deemed largely unfashionable these days.I gather that Horner’s career had stalled somewhat in recent years largely because of how tastes in film-scoring have changed. His Apollo 13 score is a reminder of his work at its height and of a time when film-scoring in general was treated differently by Hollywood. 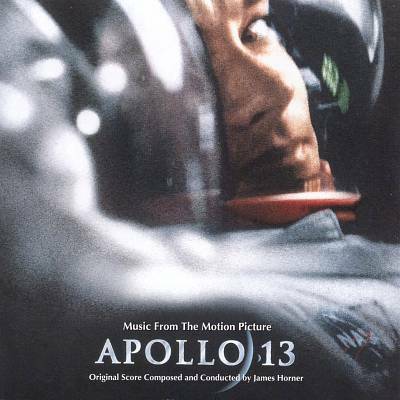 Half my pleasure in re-watching Apollo 13 stemmed simply from listening to Horner’s fine music again. Indeed, it has me thinking of digging out some of my other Horner-scored Blu-rays that I haven’t watched in awhile, like Field of Dreams, Glory and Legends of the Fall, over the next few weeks. 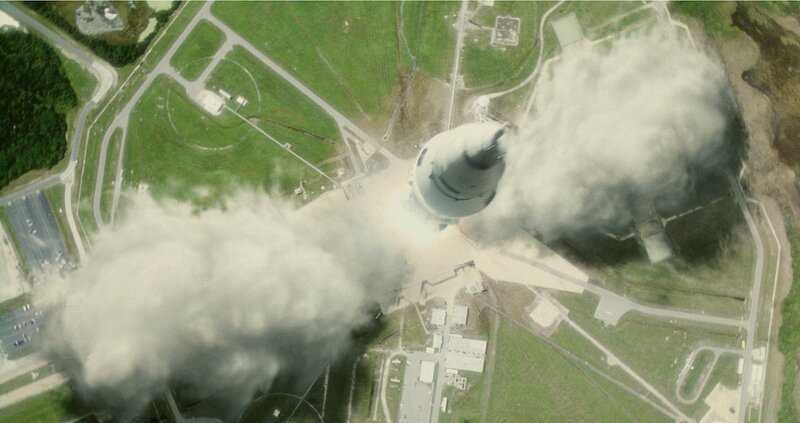 So how was Apollo 13, rewatching it again some twenty years after first being blown away by it at the cinema and then enjoying it over the years on DVD and catching bits of it on tv airings? Well its a rather sobering experience to be frank. Its still a good film, but I think my tastes have changed a little perhaps or I have become more disenchanted with contemporary blockbusters than I thought. I say this because I can now clearly see that Apollo 13 heralded so many of the bad things that annoy me most in modern blockbusters. I’m not suggesting that the film is bad, of course its not, but some things surprised me.The film lacks a sophistication that otherwise might have gained it the stature of greatness; it is clearly more a ‘product’ than ‘art’. Apollo 13 is unabashedly manipulative. Of course, all films are manipulative to some degree or another, but Apollo 13 is unreservedly so and it can be rather distracting. Some of this is purely dialogue-driven, lines spoken to explain what is going on or to add dramatic tension- in this sense the film is rather prophetic, as films these days, particularly the summer blockbusters, are full of this nonsense (I can imagine ‘Blockbuster Film’ Schools showing Apollo 13 to budding screen-writers as a lesson in how to write the modern blockbuster movie, the lecturer ranting “the public are stupid! Show them! Tell them!” over and over). This dumbing-down of movies is something I get increasingly irritated by. 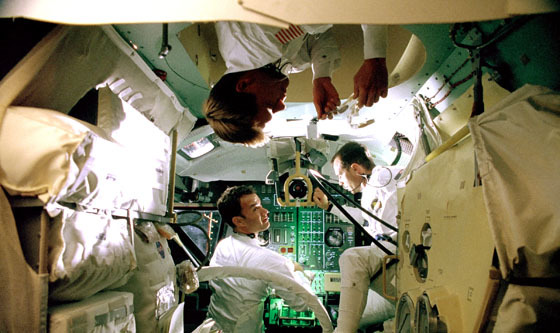 Apollo 13 has a fantastic central story, it simply doesn’t need this hand-holding of the audience. Or maybe it does; to be fair, the film was hugely successful with a general public who weren’t even alive when NASA went to the moon so maybe the film-makers were right, but for me, as someone who has always been fascinated by the space program and read widely about it, this stuff is really irritating. Other than the sometimes-painful dialogue, there are scenes written expressly to raise the dramatic tension, such as with the astronauts arguing. Dramatic license I guess. But was it really necessary? The 20th Anniversary is a lost opportunity then, as it would have been enlightening to have heard a new commentary track by director Ron Howard. It would have been fascinating, after so many years, to have Howard re-evaluate his work and perhaps comment on what he did right or what he did wrong. Perhaps he would never be so candid anyway, but still, it would have been interesting. Would he have cringed at the manipulative moments, the over-explanatory dialogue, the astronauts mild hysterics? Some things hold up surprisingly well. Technically the film is very good indeed- the special effects largely stand the test of time even under the scrutiny of HD and as I have mentioned, the music score is simply wonderful. The cinematography however does look rather flat in places and uninspired; likely this is down to a pseudo-documentary approach and an attempt to mesh the then-cutting edge cgi with the live-action photography. This last point may be something we notice more as we re-watch films from the early days of cgi special effects. The cast is pretty much wonderful, and here the film really benefits from its age, seeing so many once-familiar faces doing their work. Its pretty close to a ‘who’s who’ of Hollywood at the time it was made and also an opportunity to see the likes of Bill Paxton in a starring role (a cast-reunion commentary would have likely been a blast, I expect, so thats another lost opportunity). So rather mixed feelings about Apollo 13 then. I guess you have to be wary about re-watching your old fave movies. The news this morning as I was just about to leave for work was such a shock- James Horner, film composer of the scores of so many films, was reported killed in a plane crash (Harrison Ford’s crash a few months ago now eerily prescient and a reminder of how we almost lost him in a similar manner too). Horner was just 61. Its taken all day, and much mulling over it at work, to come to terms with it. In his later years I rather lost touch with Horner’s work (I think The New World from 2005 was the last score of his I bought) as he had fallen into repeating his previous scores, but his early work was just simply extraordinary. Any repetition and familiarity in his later work can easily be forgiven when one considers the work he created early in his career in an incredible burst of originality and creativity. For me it began with Brainstorm, watching a VHS rental copy one evening. Repeated viewings over the years would highlight the film’s failings but that first time I was utterly enthralled and captivated by the film, and no small part of this was the music score by James Horner. Beautiful, warm, sentimental, scary, the score managed to heighten all sorts of emotions during the film. I simply had to get the soundtrack album. This was back in the vinyl days, and I spent more than I could afford -really every last penny I had at the time- on the record. I still treasure it now. That album was actually a re-recording conducted by Horner with the LSO here in London (the film score recorded months earlier with a session orchestra in America I believe), and while it’s wonderful I have always hoped the actual film score would be released someday. Maybe one day. 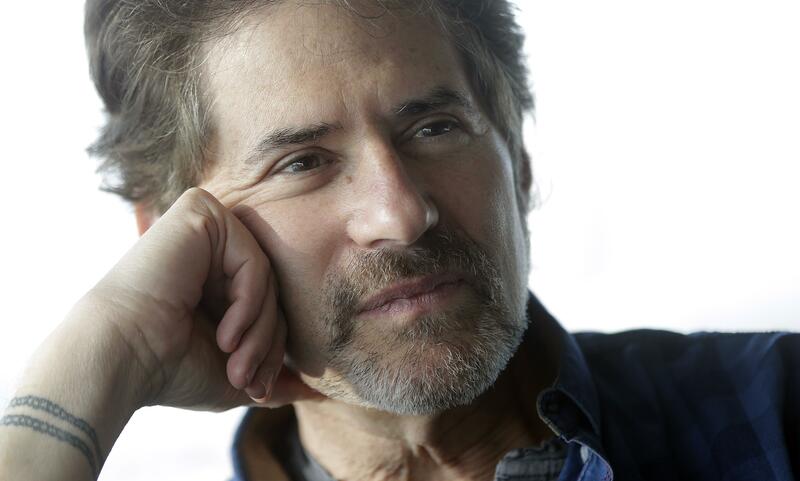 James Horner was, at the time Brainstorm was released, already a popular film composer, having had great success with the Star Trek 2: The Wrath of Khan score the year before. He would go on to greater success scoring films such as Cocoon, Aliens, Field of Dreams, Glory and so many others, culminating in a career high with his Oscar-winning Titanic. Horner seemed able to score anything; action films and comedies and emotional tear-jerkers, sometimes all in one movie. My personal preference in his work was the more quiet, contemplative scores or those with great emotional warmth and passion rather than the action material. Field of Dreams over Aliens, Legends of the Fall over Commando or Red Heat. But really in those mid-eighties I was such a huge fan of his work and the guy seemingly soundtracked my life at the time. 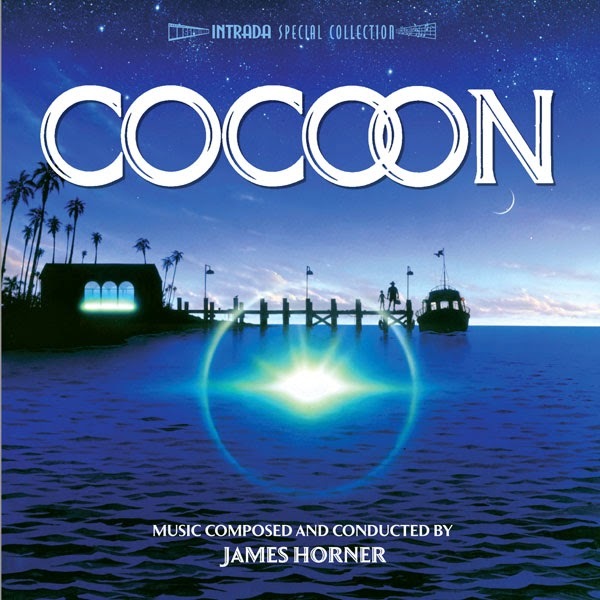 It got so I’d buy a James Horner soundtrack without even having seen its movie; his name was enough, and if ever I saw the movie first I would often be racing to a record store afterwards. Something Wicked This Way Comes, Braveheart, Apollo 13, Rocketeer, The Spitfire Grill… Brainstorm was always my favourite though. It was my first encounter with the Horner magic, after all, though I particularly loved Field of Dreams too. That movie was the only time I ever cried at the cinema, and I’m certain no small part of that was Horner’s heartfelt score. I remember driving through Cannock Chase in my beaten-up old mini with my mate Andy one gorgeous summer morning blasting the Glory soundtrack out of the car speakers. Eventually we parked up and rather than go for the walk through the forest that we intended to, we sat in the stifling heat of the car marvelling to the music. Later when we did go for the walk all we did was talk about the score and blasted it out of the speakers again when we drove back home afterwards. Such good times listening to all those scores. On a personal level, my own life would have been much less without being able to have heard and loved his music. His passing is a shock and very sad, my memories of those days filling me with some sense of how much we have lost. Perhaps his best work was behind him, but perhaps it yet lay ahead- now we will never know. Whatever one thinks of his post-Titanic scores, the world is a lesser place without his talent and he likely had great things ahead of him. Well. I know what I’m doing tonight. Tonight I shall watch Apollo 13 in memory of this composers amazing life’s work and marvel at his incredible talent, when at his best, to elevate the films he scored to something akin to greatness. 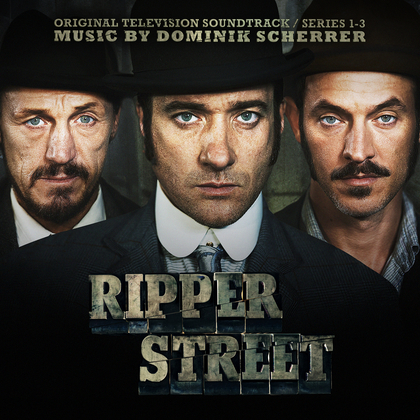 As soundtrack albums go, this one likely benefits from having three seasons to cull highlights from. It’s been assembled to provide a very good listening experience away from the visuals, and gives some idea of the scope and variety of the series itself. Indeed, impressed as I was with the music as heard in the series, this proves to be a better album than I expected it to be. Any fan of the show won’t be disappointed. I watched Arrow’s excellent new blu-ray release of The Hound of the Baskervilles a few days prior to the sad passing of Christopher Lee. I make a point of stating this because, well, it won’t ever be quite the same in future watching a film featuring him. The knowledge that there will be no more films made with Lee is a sad one, and it can’t help but colour your thinking whilst watching him now in any of his great films like The Wicker Man or Dracula or The Devil Rides Out. Some of these great old films are passing out of living memory and into history, an inevitable fact of life as the years pass but nonetheless a sobering one. Part of the power and magic of movies- performances captured onto film forever, the work of actors waiting to be discovered and appreciated by viewers yet unborn. Sadly the audiences for some of these older films may wane as time goes on -later versions of Sherlock Holmes may make later generations think that a 1959 Holmes film is pretty much redundant. That’s their loss. This is a great little movie. Discovering something ‘new’, like an unwatched Kubrick or Hitchcock film, is something rather special, which is how I approached Baskervilles as I had never seen it before and it starred the great Peter Cushing as Sherlock Holmes. Regular readers of this blog will know of my appreciation of Cushing, and seeing him in something new (to me anyway) is always something to treasure. His Holmes here is a vivid, almost mercurial one, quite a surprise when compared to his dour Van Helsing or obsessed Victor Frankenstein. He clearly relishes the part of Holmes and makes it a rather physical role rather than a still, intellectual one- there’s a jolly, almost youthful exuberance here. Its fun. Reminds me of his Captain Clegg. Its a Hammer film so its obvious why the Baskerville story was chosen, as it leans towards the horror of the story in a similar way to how Hammer’s first Dracula pared Stoker’s tale to the bone but it’s a very good version of the tale, and Cushing’s evident fun in the role makes me sad Hammer didn’t continue the series with another Holmes film. Would have certainly been a welcome diversion from Cushing’s usual Hammer roles. The film’s prologue is pure Gothic Hammer, as we see the dastardly Sir Hugo Baskerville launch the legend of the Baskerville curse with some gusto. Hammer was great at this stuff and it’s a startling way to start a Holmes movie. Christopher Lee’s role, as Sir Henry Baskerville, is most atypical. There’s nothing threatening about him here and he even gets something of a romance. Clearly this is before he became typecast (he was just too good as a villain, with so much presence on-screen) and its a pleasure to see him in something so unusual. 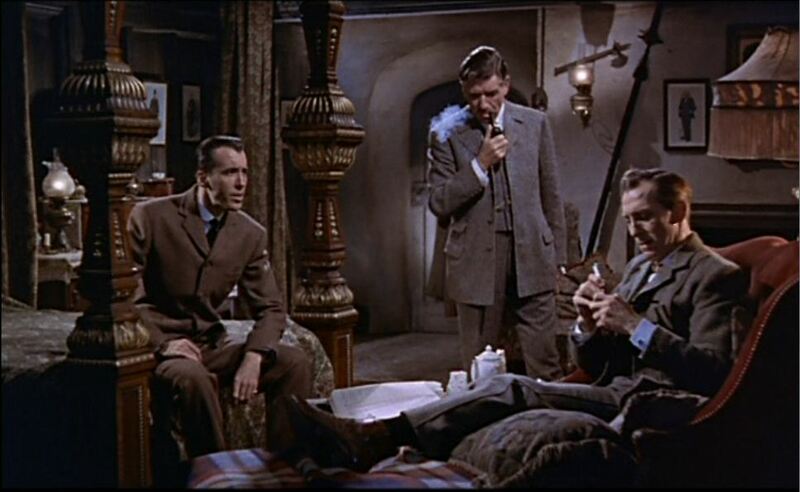 Hammer’s Baskervilles is clearly one of those ‘what-if’ movies- what if they made more Holmes movies, and Cushing starred in them, what if Lee had gotten the opportunity of more of these kind of roles. Well. Its fun to wonder. When all is said and done, I write film reviews on this blog, and you read them, because we love movies. I was wondering the other day about just when it all started for me. For most of us it’s an easy thing to state when we fell in love with movies, we know the moment well. Its usually a key moment when we ‘click’ with a certain movie, when it makes an impact on us on an emotional level. ‘Emotional’ because that’s the real kicker with any movie, at least for me- you can rationalise, on an intellectual level, the quality of a film, but where any film makes its real impact is surely on an emotional level; how it moves you, that’s where any movie really leaves its mark on you. Its why an undisputed classic like Citizen Kane may not be your favourite film- Kane is a great film easily admired but it may not have touched you in quite the same way as an intellectually inferior movie like a Ghostbusters or ET or Great Escape or Ben Hur did. Favourite movies are not always great movies, but they are often the reasons why we love movies. For me, it started with Jaws. Those of you who moan about waiting three months for a home release and are accustomed to simultaneous (or near as damn it) world theatrical releases might be alarmed at the Cinematic Dark Ages of the previous millennium when cinemagoers had to wait months just for films to cross the pond from America into our cinemas. American summer releases were often winter releases over here. So it was with Jaws, not arriving until 1976 here in the UK (It think it was actually Boxing Day 1975 for London, but it would take some months for it to eventually move out into the rest of the country… things were so slow back then!). 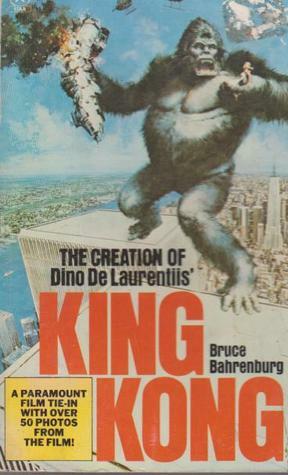 So 1976 was when all this movie nonsense started for me. I was ten years old. Of course, I’d seen many films as a kid but this was something else. My Aunt Lydia (now no longer with us, sadly) and her boyfriend (later husband/uncle) took me along on a Saturday afternoon to see the film. By this time the film was a massive phenomenon, merchandise was everywhere (I recall I was reading the paperback around the time when I saw the film) and it already clearly had a huge cultural impact- the delayed release over here actually only prolonged and intensified this. That delay -and films running at cinemas for a much longer period back then- has made me think. Nowadays films come and go in hardly any time at all, so we don’t seem to get such a scale of media saturation now. FIlms seemed to stick around longer back then, funnily enough, and home video releases now seem to have made films more disposable. I was in a supermarket the other day and quite recent films were already in a bargain bin of DVDs, which quite alarmed me. Jaws was a huge cultural event, and even some years later when it had its first tv premiere, I remember it still being a huge media event, featuring on the cover of the TV TImes. Films seemed a Bigger Deal back in the day. In my life, I think the only other film with a similar cultural impact as Jaws would be Star Wars a few years later (well, 1977 in America, 1978 over here). I’ll never forget that Saturday afternoon. Indeed, to this day I cannot watch Jaws divorced from those memories, those feelings that screening engendered in me- everytime I’m pulled back to that cinema experience. Its funny how sophisticated audiences are now, everyone seems to laugh at the rubber shark, but it was never like that for me or indeed most audiences at the time. For us that shark was real. Of course, the film scared me shitless. But it wasn’t gore or anything graphic, it was more the anticipation, the fear of the unseen, the threat in those watery dark depths. I think the sophistication of audiences now… well I think they’ve lost something. Everything is so literal now. Thanks to cgi there’s no need to tease or hint, everything can be visualised up on the screen and from a storytelling standpoint and audience experience I think something has been lost. Sure it’s great to see such huge impossible things on screen these days but does it really now have to be so… complete? 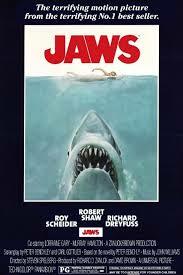 The genius of Jaws is in its editing, and what is unseen. Most of this wasn’t at all intended, it was rather a triumph against adversity. The shark didn’t work, and many of the shots Spielberg wanted couldn’t be done, even with the shoot extending from some 55 days to 159 days. The shoot was a nightmare and Spielberg worried his career was already over. But all the disasters and technical problems that resulted in the production being forced into working around a non-functioning fake shark proved to be the making of the film. John Williams turned in an incredible score that provided all the tension that the fake shark couldn’t- you didn’t need to see the shark; you could hear its threat just in the music; it’s Pure Cinema, something much more effective than a contemporary authentic-looking cgi shark might ever be. Indeed Jaws is one of Spielberg’s best films simply because it has to be held back by its technical limitations; Jaws is Speilberg in Hitchcockian mode and he’s all the better for it. He can’t fall back on Douglas Trumbull or ILM excess to carry the picture. Consider the difference between Jaws and the excess of 1941. Needless to say, Jaws is my favourite Spielberg film- maybe not his best film, I appreciate that his later films have their merits- but certainly my favourite. When the film got released in cinemas a few years ago (2012 was it?) I naturally made sure to see it on the big screen again. I’ve never read a Jack Reacher story. There’s something like twenty books written in the series and I’m ignorant of all of them. I’ve opened this post by stating that, simply as a disclaimer that for fans of the novels, I’m likely wholly unworthy of writing this review. You see, I am fully aware that the character that author Lee Childs writes about in the books bears little similarity to Tom Cruise. The Jack Reacher in the books is a big bloke apparently. And Tom Cruise is hardly a big bloke. A friend of mine at work has read the books and has no time at all for the movie, has indeed warned me off it until now. So anyway, I’ve finally gotten around to watching it, and free from any comparison with the character of the books, I must say I rather enjoyed the film. Tom Cruise is, well, Tom Cruise. Maybe a more restrained than usual Cruise but, yes, its Cruise. He is what he is. Ironically I don’t believe Cruise is the film’s problem performance-wise; I’d instead point the finger at Rosamund Pike, who is pretty woeful here as an attorney who hires Reacher to help solve a case. She’s just ‘off’ somehow; I didn’t believe in her at all, she just seemed ill-cast or ill-directed or something. She’s been very good in other films I have seen her in (most recently she was excellent in Gone Girl) but here she just doesn’t fit, somehow. I guess the controversial casting of Cruise in the title role deflected attention away from her because I honestly think she’s the one miss-step that the movie makes. Otherwise its a calmly effective action-thriller that is decidedly low-octane and down-to-earth. As far as Tom Cruise films go, think of it as an anti-Mission Impossible flick if you will. Which may not be a bad thing, I suppose it depends on how loud and explosive you prefer your action thrillers. 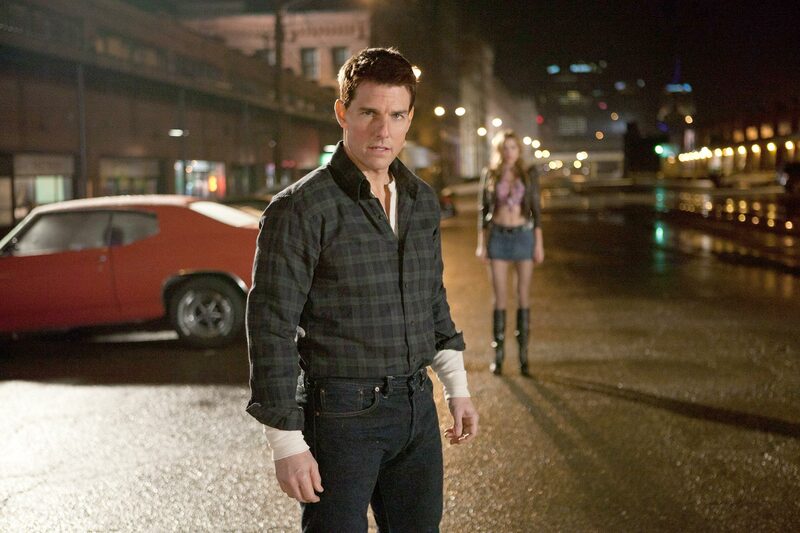 Indeed I would like to see a sequel, and feared that was a non-starter following the backlash from the Jack Reacher book fans, but it seems another Tom Cruise-starring Jack Reacher film is on the cards. No doubt fans of the books are gnashing their teeth at the prospect but I’m rather looking forward to it. 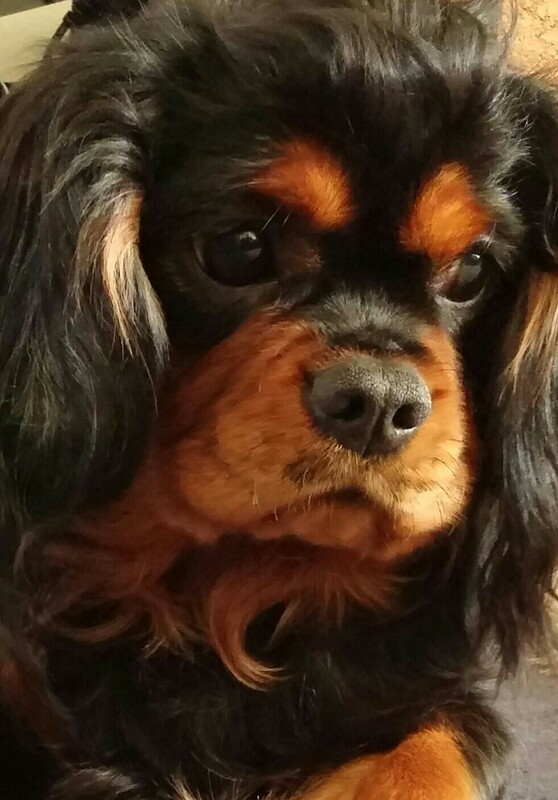 Here’s a recent picture of Ben, our King Charles Cavalier in his usual thoughtful mode.. well, he’s being either thoughtful or miserable, I prefer to think the former! I’d always intended on posting updates about him once in awhile but here we are something like 18 months since I last posted a picture of him (and then some- he’ll be two in a few months time). I must try harder (so sorry if you hate pictures of dogs, just feel free to ignore them).